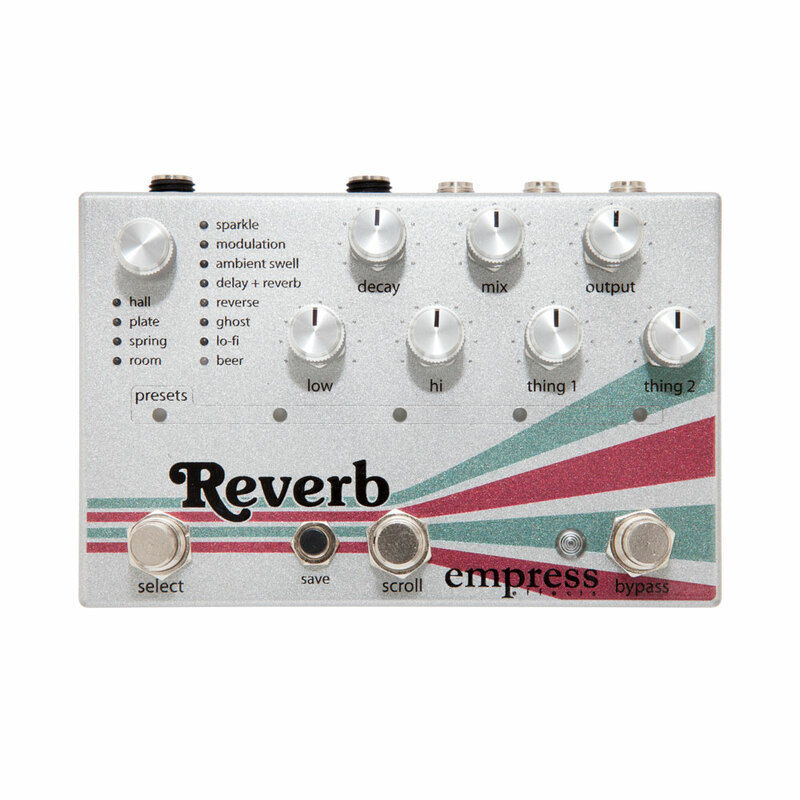 The Empress Effects Reverb Pedal provides studio quality effects from classic hall and spring reverb to modulating and reverse sounds in a tweakable but easy and fast to dial in package. On board are 12 reverb types, with multiple sub-variations giving 24 effects in total which can also be edited and saved as presets or updated via the SD card slot. The tone of the reverb can be sculpted with the decay, mix, low and hi eq knobs and through the 'thing' knobs, the thing knobs are very clever parameter knobs that change what they adjust based on reverb type selected (e.g. the amount of modulation, reflection, delay time etc. ), your setting can then be saved and recalled as one of 35 possible presets. The select switch also acts as an infinite hold or tap tempo on many of the effects, the control port allows you to use an expression pedal (any combination of parameter knobs can be controlled via the expression pedal), an external tap switch or MIDI control, and an advanced configuration mode lets you tweak a variety of pedals deeper functions (e.g. changing it from buffered bypass to true bypass or adding in a cabinet simulator). Stereo in and out completes the studio quality sound possible with the Empress Effects reverb pedal. Modulation, applied to each of the delay lines gives a warm and smooth chorus style sound without the distinctive pulse.